« Diary of a Layman #5 (Winter 2007): Mystery Project Revealed! Even though I live in NYC, it’s not often that I see people with mohawks. I mention this because yesterday, I saw a guy carrying a baby that had one. I thought this odd, yet cool, and quickly forgot about it. But as I was getting off the subway a couple hours later, I saw a five-year-old kid with a mohawk standing right in front of me, about to get on. Now I found this very peculiar. Was there some kind of mohawk convention going on in the city? None that I knew of. Stranger still, fifteen minutes later on the other side of town, I saw yet another Mohawk! This one donned by a twenty-something, otherwise normal looking fellow! What was going on?? If this isn’t odd enough, my name, Marc, means “warrior” and I’ve recently signed up for a cool outdoor hiking/training program Upstate called “The Enlightened Warrior Training Camp.” So what does any of this have to do with my Layman* and LOST** books? Well, as challenging as writing a book is, trying to get one published is equally so, if not more. You really have to be a warrior—or crazy—to go through the process. Thankfully, I’m both, which is why I’m confident that eventually, these books will be published. Perhaps not as quickly as I’d like, but I will stick with them until the end. That’s what a warrior does. He has a goal and stays true to it no matter what the odds or what the Negative Nancies, Debbie Downers, or strange voices in his head have to say about it. I learned this from a cool book called The Layman’s Answer’s To Everything and it’s why I’m trying to get it out there to the masses. To do that, however, the warrior must first go on a journey where he will face many challenges that will help him grow to become the person he is destined to be. The part of the journey I’m on right now, is trying to gain the help of an agent (wizard) who can work his magic to guide me through the kingdom of publishers in hopes that one might buy my LOST book (goods) for a small sum of gold (minus 15% wizard commission). Unfortunately, it would seem that wizards that are interested in my current offering (an unauthorized LOST book) are in short supply, but not to worry! Warriors who have been through enough training can skip over the wizards/kings step and deliver their goods straight to the public with the help of something known as the personal printing press (on-demand publishing.) In fact, this process tends to be a lot quicker and more efficient than the wizard/king method anyway, and does not really require much of the warrior’s own coins. So, there’s a very good chance that this warrior may chose to travel that route. At the very least, it will serve as a good test to see if such a path might also work for his much bigger Layman wares. So, will this warrior find a wizard, or go it alone with the services of a personal printing press? And what about the fire-breathing dragons and evil trolls that lurk over yonder? And let’s not forget the pursuit of a fair maiden. I, for one, can’t wait to see where this story is going! PS: Also, if you haven’t already done so, please check out my other creative, yet admittedly much less spiritual project: “A Day in the Life of a Competitive Eater”—a two-minute mocku-mentary featuring Troy “The Tornado” Larsen! 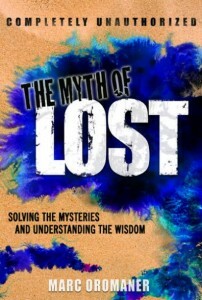 **The LOST book is called, The Myth of LOST: Solving the Mysteries and Understanding the Obsession. It not only reveals a solution that explains all the mysteries of the show, it also explains how the show’s wisdom can be applied to our real lives.